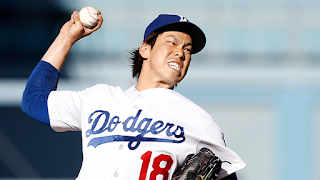 A pitchers duel went the Dodgers' way Sunday as Kenta Maeda shined yet again to continue an excellent start to his MLB career. With the 3-1 win, the Dodgers took the weekend series over the Giants and a division lead in the NL West. After two starts with six shutout innings each, Maeda allowed only one earned run in seven innings pitched. That raised his ERA to 0.47, and his seven strikeouts and four hits allowed were both career bests. "It's still a pretty small ERA," said San Francisco second baseman Joe Panik, whose third-inning home run accounted for the Giants' only run. "I've been really cautious about putting a number on expectations," Dodgers manager Dave Roberts said of Maeda. "You just want to go out and watch him compete, and he prepares well. You look at him after three starts and where he's at right now, he has exceeded expectations. He's throwing the ball as well as anyone in baseball right now." Jeff Samardzija was nearly as good until he ran into trouble in the seventh inning, when he allowed three straight baserunners and a run without registering an out. A shutdown relief appearance by Josh Osich held the inning's damage to one run. Catch-and-release: The Giants had Maeda on the hook in the first inning, when he walked Panik and Hunter Pence. At one juncture Maeda had thrown 13 balls and just nine strikes. But he induced Brandon Belt's harmless fly to center field, ending the inning. That enabled Maeda to gain his equilibrium. "Once he got past the first couple of innings, he commanded the ball better in the zone," Giants catcher Buster Posey said. Puig strikes again: Yasiel Puig demonstrated his bold baserunning yet again in the seventh inning. After singling to center field, Puig stole second then scored on Yasmani Grandal's single to give the Dodgers an insurance run. "From the other side, there were some things about running the bases without a purpose," Roberts said. "But I think that right now, of all the times that he's taking extra bases, trying to steal a base, it's a good baseball play." Osich overwhelming: The rookie left-hander continued to raise his profile by retiring all five batters he faced. Osich relieved Samardzija with two runners aboard and nobody out, yet didn't allow a run to score as he coaxed Kiké Hernandez's fielder's-choice grounder and pinch-hitter Trayce Thompson's doubIe-play ball. Giants third-base coach Roberto Kelly left the game before the seventh inning, shortly after being struck by a thrown ball that entered the dugout. Kelly was wearing his protective helmet at the time but still needed attention from the athletic training staff and went to the clubhouse to receive treatment. Giants: San Francisco will meet the D-backs beginning at 7:15 p.m. PT Monday to open a 10-game homestand. The Giants will start Jake Peavy, whose 17 wins against the D-backs leads all active pitchers. Peavy yielded 10 extra-base hits last Wednesday at Colorado -- the most by any Giants pitcher since the franchise moved West in 1958. Dodgers: The Dodgers will be off Monday before beginning a six-game road trip in Atlanta.Alex Wood will take the mound at 4:10 p.m. PT Tuesday against his old team as he tries to build on a strong start (7 IP, 1 ER) against Arizona last Wednesday.